Sciatic nerve pain can be caused by arthritis, a pinched nerve, bone spurs, or a number of other reasons. Because the sciatic nerve is the largest nerve in the body, it’s easy to see why damage to the nerve and the resulting pain can be cause for alarm. Pain, tingling and numbness that runs down the lower back, hips, buttocks and down each leg (i.e. the sciatic nerve path) is known as sciatica. Sciatic nerve pain can be intense and is often felt when sitting, standing for long periods or when performing any tasks that cause the spine to flex. A ruptured or bulging disc directly pressing on a connected nerve is the most common cause of sciatica, but any irritation or trauma to the sciatic nerve can lead to pain. Weakness, a burning sensation, numbness and pain throughout the sciatic nerve path are the typical symptoms of sciatica. The pain can also travel around the hip or buttock. Since these symptoms can be aggravated by bending and walking, some sufferers may feel imprisoned and immobile. While the severity of sciatic nerve pain may be unbearable at times, the good news is that some people can be effectively treated within a few weeks, without surgery. Yoga. Yoga can help you improve your flexibility while also strengthening your muscles, giving individuals that struggle with sciatic pain the ability to avoid postures that tend to aggravate their sciatica. Exercise. Taking 20 minute walks, swimming or doing water aerobics are great ways to increase blood flow, which can work out problem-causing chemicals surrounding the nerve. Pain relievers. Over the counter pain relievers and some natural herbal remedies can help calm the area. Lie on your side. The easiest pain relief method for sciatica is to simply lie on your side opposite the pain. If self-care measures taken over a period of a week do not alleviate your symptoms or if your pain increases in severity, it’s time to visit a healthcare professional. 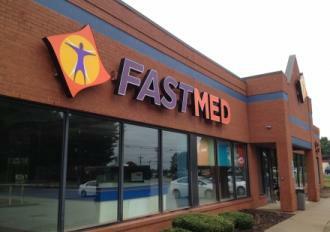 At FastMed, we work hard to get you in and out of our clinic as quickly as possible. Each of our clinics are equipped with on-site labs and X-ray machines, saving you time and energy if more advanced diagnostics are required. While we strive for speed and convenience, we also provide each of our patients with quality care. Visit our website today to find the FastMed nearest you. Don’t suffer from sciatic nerve pain any longer!